Hey bro I need a help to built a mobile which works 12v DC to 5v DC supply (car mobile charger) with 1.5A to 2A output. This is because when I can charge my mobile in car the percentage of battery can’t go up but it stands constant and then starts decreasing slowly slowly, but the mobile shows that the charger connected and show charging. And when I charge the mobile in my house with wall charger (model c-p68) the mobile is charged rapidly fast with watching movie and data connection on. For making a charger I was used voltage converter 7805 also but the results are not good. mobile model is Lenovo Vibe K5 plus. 7805 can supply only 1 Amp at best, you’ve to use either a small inverter with your regular charger or a buck converter module. Buck modules are way more efficient than inverters, occupies less space too, can deliver up to 3 Amp, 2 Amps easily without heat sink. Get one of those and they’re going to need a multimeter to set the output voltage for the first time. Add a little piece of aluminium channel as heat sink. Bro can you tell your WhatsApp number for some conformation on my topic please you can email me your number. hello sir i want to make mobile charger transformer .please tellme how to make where i got material ? You can get the copper wires and ferrite core from an old CFL, try a 9 watt or 15 watt CFL. I have a strong interest in knowing how the mobile charger circuit works. pls can I get a tutorial on the function of each component in the circuit? I have a similar sketch of one of my phone charger circuit but it differs a bit. Any available email to get in touch with you? mail: arnab.fmn(at)gmail.com , but please be patience. Thanks for replying me. Waiting to hear from you. Please,sir l need your help for the calculation to get like 2-3amp. You can use this circuit, http://danyk.cz/impulz_en.html . And adjust the resistors around the TL431 IC to get 5 volt. How much current i get at output???? Actually i m looking for 220v to 5v with output current 2.2A. As a biginer, please I need a direction or any online class on how to repair chargers, thanks. i have a battery of 20amps i need charge it with a circuit which can withstand that 20amps current at 3.7 volt how can i design charger circuit and should work in all type of temperatures without fail. It’s hard to tell anything without inspecting the charger myself, sorry Samuel. Sir please tell me why some charger circuits uses only few components and others contains more resistance and capacitance along with some circular items ,.Sir I also want to know why same charger cannot charge all mobile if the charging pin is also same . Please send me the circuit of phone charger. I’ll try to send you how this circuit works, however you can read about flyback converter and flyback topology. These type of charger circuit works on the above principles. ok sir in some circuit they have used s9014 transistor along with 13001 so i am getting confused and what output voltage is coming from the 13001 transistor which is going to primary of the transformer and is that transformer giving DC to DC output. Powered by AC or DC ? If you are not making it for your school/college project, then it’s always better to buy one than making. Thank you for this post. I was exactly looking for this circuit. I just want to know where I can get this small size of transformer as I want to make a fresh circuit with this schematic by myself. 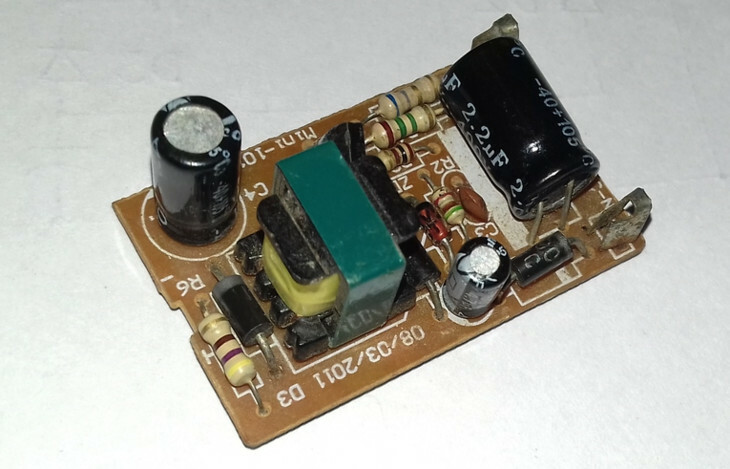 Do you have any idea where I can find this small transformer? From old CFL bulbs or old chargers.